And I guess I failed to include in the last post an update on our fourth family member. Are we really going to be a family of FOUR?? From his latest photo shoot, here's Mr. Fetus, giving us all a big kiss. He looks healthy from all the ultrasounds, so I may only have to do one or two more towards the end of the pregnancy to make sure his placenta doesn't just check out on us like Carson's did. This child is a MOVER. I never felt Carson kick and move like this baby does. One time I sat with my laptop propped up on my belly, and the computer just about jumped off my lap when there was a sharp movement from the inside. He keeps me (and sometimes Rick too, depending on the cuddling proximity) awake during the night with his endless dances. I hope this doesn't mean he's going to be high energy... I cringe in fear when I come across books or articles with titles like, "Your Difficult Child," or "Taming the Spirited Child." Pleeeease not this one. And... here is another ultrasound picture. Most of the pictures have looked like a normal baby, but the more I look at this one, the more it makes me wonder what on earth this child is going to look like. His upper lip comes out further than his odd little nose! Let's just hope it's a bad angle. Ten more weeks and we'll see what he really looks like! Today is a no-car day. We've already used up our gasoline allotment for the week with lots of little trips: library, playgroup, Dr. appointment, visiting teaching, Target/Costco, etc. Thank goodness it promises to finally be a sunny day, which means a nice looong walk is in order! A no-car day = a blogging day. So here are a few fun facts about our lives as of late. Did you know that our wonderful school here is pretty good at basketball?? Rick and I had a real date last week when we went to the Wake (#1) versus Virginia Tech game. Sadly, it was a heartbreaking loss. Last night, Rick went to the Wake (dropped to #4) versus Duke (#1) game. It was a very exciting WIN!! Rick came home extremely pumped, and all he could think about doing was showing me the highlights online. We ate an entire cookie-sheet full of nachos, watched the highlights, and went to bed happy fans of a #1 team. Rick did not rush the court at the end, but apparantly lots of people did. Carson is an incredibly sweet little boy. He kisses. A lot. Some days that involve lots of me playing on the floor with him, I feel like I'm involved in some make-out sessions. Here he's trying to convince Sadie to give him a taste of her lips. I can tell he's going to be a sweet little helper: if I am ever holding him and he sees a kitchen cupboard open, he just can't stand it and leans wayyy over to close it. He can also close the dishwasher by himself, and today he handed me spoons and forks one at a time so I could put them away. And finally, our fireplace mantle has a new look. These silhouettes were super fun to make. I think the wreath needs some work, though... after Christmas I tried to put the old stuff up, and it just isn't working. Carson can sign about 20 words!! When he's sitting in his high chair and runs out of cheese, I LOOOOVE that he just looks at me with big eyes and signs "more" instead of screaming or doing anything else unpleasant to tell me he wants more cheese. Another favorite sign is "dog" (you pat your leg). When we're on a walk, if he sees or hears a dog, that hand goes flying down to his leg to pat, pat, pat. The other day, he was bundled up super tight with lots of blankets during the walk. I heard a dog bark, and sure enough, you could see some movement under all those blankets... a little hand going pat, pat, pat. And as we walk through Costco, he just has to see the sample cart for him to start signing "hot!" For the record, his list of signs includes: more, food, thank you, hot, fish, dog, cat, car, airplane, shoes, hat, milk... and that's all I can think of right now. Carson also verbally says "moo" for cow and "baa" for sheep, along with the usual dada and (finally!) mama. His most frequently said word is "ball;" he is definitely his father's son and LOVES balls. He also says "cracker," (just "ka" really), and recently "book," which sounds pretty much the same as "ball," but I know what he means. During the past year, I've frequently said to Rick, "I can't wait until Carson can just talk to us!!" We're on our way! This is an amazingly wonderful, changes-the-way-you-see-the-world kind of book. I will admit, however, that there were times when I had to convince myself to keep reading. Getting through the first few pages was a challenge, and then again there was a lull towards the end when I kept thinking, "isn't the story over yet?" But in between those parts was a truly amazing story. I absolutely recommend this book. A quick summary: Greg Mortenson, a mountain climber who was raised mostly in Tanzania, attempts to climb K2 in Pakistan, the second highest mountain peak in the world. After a dramatic attempt, he's forced to come down without reaching the peak, nearly dead and feeling like a complete failure. He takes a wrong turn on the way down and ends up in an isolated village called Korphe, where the residents have never seen an American before. Basically, Greg falls in love with the people of Korphe and they with him. He realizes that they have no schools (among many other things...like a bridge that could actually connect them to other villages), and he vows that someday he will come back to build these children, who discipline themselves by meeting outside in the cold to scratch multiplication tables in the dirt, their first school. 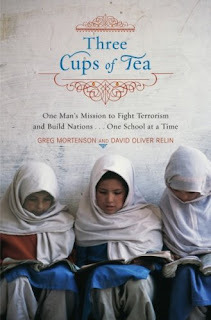 The rest of the book details Greg's journey to keep building schools in Pakistan and then Afghanistan. This book also opened my eyes to new ways that we can fight the war on terror. It makes so much sense to me to get at the terrorists from the roots, instead of just trying to destroy the already existing Taliban. If we were to educate educate educate in Central Asia, preventing the brainwashing that turns young boys into future Osama Bin Ladens, we could win the war on terror without all the killing and destroying. Finally, I very much admire the religious devotion of the Muslims. If I could only be that dedicated to prayer!! Reading this book was so inspiring and thought-provoking; I hope you can read it too, Inshallah. Basketball in the loft is a favorite activity at Greg and Suzette's. Rick serves as team captain and referee, and the little boys work so hard they have to remove their shirts. Time-outs for foul play are a common occurance, and once Rick even placed himself on the time-out couch when he got a little over agressive. We will remember this night as the first time Carson really started walking all around instead of just taking a few steps. During our stay at Paul and Amy's house, we got tons of snow! All the boys had a great time shoveling. ...and to play football in the snow! More fun with nieces and nephews. At Jeff and Joni's, Carson had some first-class babysitters while we got to go to the temple. Christmas morning at Grandma and Grandpa's. By the end, Carson totally got the whole present-unwrapping ritual. Side note: I think my favorite gift is my new swiffer-mop made for cleaning wood floors!! I love that thing! At Bruce and Jeanel's, we got to see their neat tradition of sledding on Christmas Eve. The best part is that the awesome sledding hill is right in their front yard, courtesy of the snow shoveled from their driveway. Us with the Stanley's, minus Ryker. Phew, now I can return to posting about current instead of past events! Still working on getting more items up there, but I can create most anything with words or letters and am figuring out how to do pictures and figures better, too. Let me know if you have any vinyl requests! Remember when we forgot to pack socks for Carson during our Christmas travels, and the one pair we did have was soon discarded by the little man? Finally finished the curtains for Carson's room! This is my first sewing project since the old 8th grade pajama pants. And the patterns intimidated me, so I just did without. They turned out all right, but now I totally want to take a sewing class. After Carson's nightly bath, we throw him on our bed and let him jump around in the pillows. He loves this! When we go on walks, for some reason Carson always lays back in the stroller and doesn't even want to sit up or look around. He just sort of broods there. During this particular family walk, he held his piece of bread in his mouth the entire time. And, Carson's first biting experience!! Our little 2-year-old friend was just giving Carson a huge hug and a kiss, and somehow he ended up clamping his jaws on Carson's forehead. The red mark lasted for days!! why I didn't blog over the holidays. partied with Rick's fam and exchanged home-made gifts. attended my sister's wedding and par-tay. visited more family (aunts & uncles, great aunts) around northern VA.
drove the 6 hours back to home, sweet home. Oh yeah, and I think we celebrated my birthday, Christmas, our second anniversary, and New Years somewhere in there. Now we are cleaning, organizing, budgeting, studying (Rick) and nursing the wonderful illnesses that we contracted during our journeys. Pictures to come. Someday.